"This is a slightly more spicy (zingy?) take on the paleo-style cauliflower fried rice with pork. You could use any protein. Adjust the poblano chile to mild it down or heat it up as desired." Pulse cauliflower in a food processor until it resembles rice. Heat sesame oil a large wok or skillet over medium heat. Season pork chops with five-spice powder; cook until pork is slightly pink in the center, 2 to 3 minutes per side. An instant-read thermometer inserted into the center should read at least 145 degrees F (63 degrees C). Transfer pork chops to a cutting board to rest. Whisk soy sauce, brown sugar, fish sauce, red pepper flakes, and ginger together in a bowl. Return wok to medium heat; cook and stir mushrooms, onion, carrot, and poblano chile until tender, about 4 minutes. Cut pork chops into cubes. Push mushroom mixture to one side of wok. Add eggs; cook and stir until scrambled, 1 to 2 minutes. Stir mushroom mixture and eggs together in wok. Stir in cauliflower and soy sauce mixture; add pork cubes. Cook until cauliflower is tender, 3 to 4 minutes more. Garnish with green onions. Liquid amino (such as Bragg's®) can be used in place of the soy sauce, if desired. I used small pork chops for this recipe; about the size of your palm. It was decent. My teenagers ate it. Nothing special about it. Next time I will make it with shrimp. The best recipe we've tried for substitute fried rice! I loved this recipe. I used shrimp instead of pork and I added snap peas. It was delicious and very filling. I will definitely make this again. So good! My husband is not a fan of cauliflower, but he said it was the best cauliflower he had ever eaten. 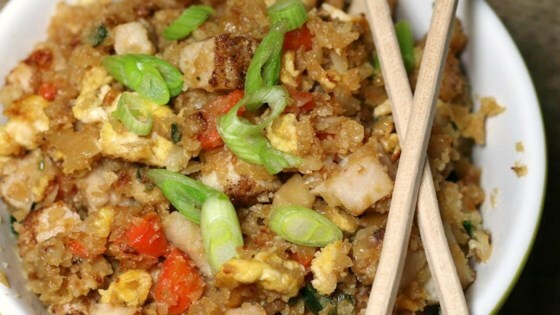 This recipe has great flavor and was such a good swap for regular fried rice. Didn't have mushrooms so used snow peas and capsicum. It was yummy. Quick, easy, healthy, and really good! I didn't find this to be at all spicy (hot). I added a little chicken broth at the end to keep it from being dry.